Healthcare has a rich history in Kewanee, and local healthcare officials are also looking to the future. On May 31, 2008, OSF Saint Luke Medical Center opened a brand new healthcare facility on the corner of Midland Road and South Street. The state-of-the-art facility was designed to meet the healthcare needs of Kewaneeans and residents of surrounding communities. Whether it�s emergency care, preventative services or specialized needs, health providers are available in a number of areas. 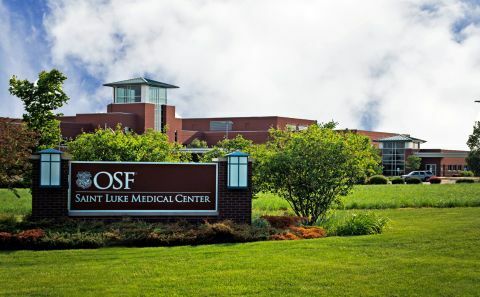 OSF Saint Luke Medical Center is designated as a Critical Access Hospital, a status obtained through Medicare and administered through the state, allowing for greater Medicare reimbursement without changing the focus of patient care. OSF Saint Luke Medical Center is a private not-for-profit 501(c)3 organization that provides a full range of services including a 24-hour physician staffed Emergency Department, General Surgery, Breast Health Clinic, Family Health Clinic, Urology, Orthopedics, Ophthalmology, Pathology, Radiology, Pain Management Services, CardioPulmonary, Cardiology, and Rehabilitation Services including Physical Therapy, Occupational Therapy, Speech Language Pathology, and Competitive Edge Sports Conditioning all within an easily accessible, community oriented facility. OSF St. Luke Medical Center is not a taxing body and receives no revenue from taxing the public. To maintain its services, it relies on funding from its operations and from charitable donations. The Henry and Stark County Health Department offers many wellness and health promotion programs, including immunization clinics, maternal and child health, home health services and environmental health. Services are available to all residents, regardless of their income or source of payment. A number of physicians and dentists practice in Kewanee as well as several social service agencies and rehabilitation facilities to assist all ages. Kewanee�s proximity to larger metropolitan areas also make it convenient for patients to consult with specialists and services offered in Peoria, Galesburg and Quad Cities.